We individually hand-set a 14k yellow gold solitaire cathedral setting using only high quality 1 carat cubic zirconia stones that are difficult to distinguish from diamonds. Set in a high-end, quality ring that was originally crafted for a diamond, this high-end princess cut cz ring is created to look like a natural, authentic diamond ring! Also available as a natural, authentic diamond ring in 1/4 Carat, 1/3 Carat, 1/2 Carat, 5/8 Carat, and 3/4 Carat. 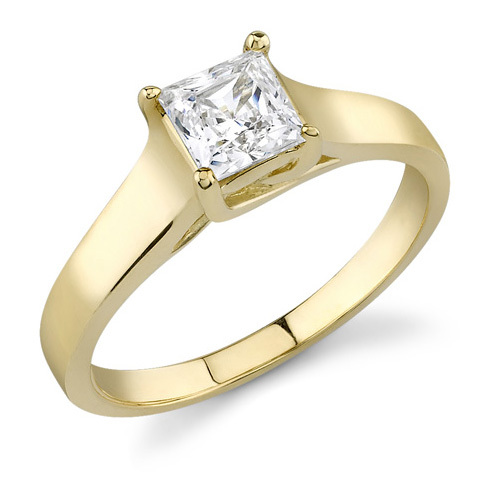 Apples of Gold Jewelry guarantees the Cathedral Style Princess Cut CZ Ring, 14K Yellow Gold to be of high quality and an authentic engagement ring with real diamonds, as described above.